The continued improvement and reduction in costs associated with fiber optic technology associated with fiber sensors permit application areas that were previously inaccessible. These trends are expected to continue as new techniques become available and older ones are successfully adapted to new applications. 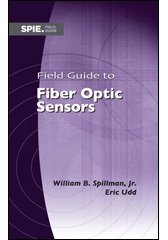 This Field Guide provides a broad introduction to a variety of fiber optic sensors that have been successfully developed from the 1970s to the present. A wide range of examples are provided to inspire readers with ideas for new sensors and uses. Why Use a Fiber Optic Sensor? Fiber optic sensor work began in the mid-1970s with a variety of multimode fiber optic sensors and early iterations of Sagnac and Mach-Zehnder interferometers. Concerted efforts developed fiber optic gyros and acoustics sensors in the form of hydrophones; fiber gyros are currently used for aircraft and spacecraft navigation, including the Spirit and Opportunity rovers on Mars. They are used for naval and land navigation, in robots that mow soccer fields and clean floors, and in remote-controlled helicopters that spray crops. Acoustic technology originally developed for undersea surveillance is now used to support oil and gas exploration and extraction operations. In the mid-1980s the field of fiber optic smart structures emerged as a way to monitor the health and integrity of structures through the manufacturing process, during installation, and throughout the lifetime of the structure. Distributed sensors based on Raman and Brillouin scattering have been used to support cure monitoring on large concrete structures such as dams and to monitor oil holes and pipelines. The continued improvement and reduction in costs associated with fiber optic technology associated with fiber sensors permit application areas that were previously inaccessible. These trends are expected to continue as new techniques become available and older ones are successfully adapted to new applications. This Field Guide provides a broad introduction to a variety of fiber optic sensors that have been successfully developed from the 1970s to the present. We hope that the included examples inspire readers with ideas for new sensors and applications.